MY "KINGDOM FOLLOWERS' HAVE ALWAYS ASKED ABOUT MY COLLECTABLES THAT WENT TO ILFORD IN 2006. (HERE IS THE COMPLETE STORY OF HOW THEY GOT THERE "ILFORD CAMPING TRIP"). IN FEBRUARY OF 2011 VINCE AND JONATHAN VOLUNTEERED TO BRING MY COLLECTABLES HOME. 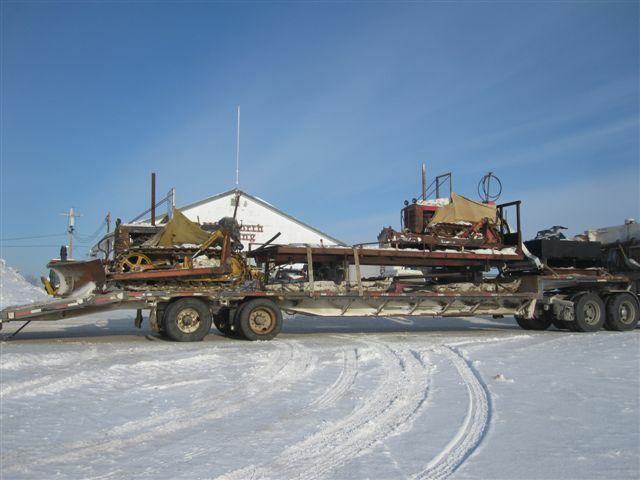 THEY SURE HAD A LOT OF FUN LOADING EQUIPMENT THAT SUNK IN TO THE MUSKEG IN 5 LONG YEARS. THE GUYS WERE ABLE TO RENT THE EQUIPMENT FOR THE NATIVE BAND TO LOAD MY COLLECTABLES. ONE THING I FORGOT TO TELL THEM WAS THE SLEIGHS COME A PART. THE SLEIGHS COME APART SO THEY WILL FALL APART WHEN THEY FALL THROUGH BAD ICE. BUT IN THIS SITUATION IT MADE MORE WORK FOR THE GUYS. THE STEEL SLEIGHS I HAVE BUILT SURE ARE TOUGH BUT THEY DO BREAK. THEY LOAD THE LITTLE TD-6 KNOWN AS THE "CURSE OF REVERSE" ON THE SLEIGH. THEN LOAD THE SLEIGH ON THE SEMI TRAILER. NEXT THEY PULLED, PUSHED AND DRAGGED THE "FAMOUS BLACK CAT" ON TO THE SEMI TRAILER. OF COURSE THERE IS ALWAYS TIME FOR A SUN SET PHOTO, LOL. HERE IS THE FIRST LOAD OF COLLECTABLES ARRIVING IN LYNN LAKE. ONLY 2 MORE TO GO.